Gwynedd (Welsh pronunciation: [ˈɡʊɨnɛð]; English: /ˈɡwɪnɪð/) is a county in Wales, sharing borders with Powys, Conwy, Denbighshire, Anglesey over the Menai Strait, and Ceredigion over the River Dyfi. The scenic Llŷn Peninsula and most of Snowdonia National Park are in Gwynedd. Bangor is the home of Bangor University. In the northern part of the county, the other main settlements are Caernarfon, Bethesda, Ffestiniog, Llanddeiniolen, Llanllyfni, Porthmadog and Pwllheli. The largest settlement in the south is Tywyn. As a local government area, it is the second largest in Wales in terms of land area and also one of the most sparsely populated. A majority of the population is Welsh-speaking. Gwynedd also refers to being one of the preserved counties of Wales, covering the two local government areas of Gwynedd and Anglesey. Named after the old Kingdom of Gwynedd, both culturally and historically, Gwynedd can also be used for most of North Wales, such as the area that was policed by the Gwynedd Constabulary. The current area is 2,548 square km (983.78 sq miles) slightly smaller than Luxembourg, with a population of 121,874 as measured in the 2011 Census. In the past, historians such as J. E. Lloyd assumed that the Celtic source of the word "Gwynedd" meant "collection of tribes" - the same root as the Irish fine, meaning "tribe". Further, a connection is recognised between the name and the Irish Féni, an early ethonym for the Irish themselves, related to fían, "company of hunting and fighting men, company of warriors under a leader". Perhaps *u̯en-, u̯enə (strive, hope, wish) is the Indo-European stem. The Irish settled in NW Wales, and in Dyfed, at the end of the Roman era. Venedotia was the Latin form, and in Penmachno there is a memorial stone from c. AD 500 which reads: Cantiori Hic Iacit Venedotis ("Here lies Cantiorix, citizen of Gwynedd"). The name was retained by the Brythons when the kingdom of Gwynedd was formed in the 5th century, and it remained until the invasion of Edward I. This historical name was revived when the new county was formed in 1974. Gwynedd was an independent kingdom from the end of the Roman period until the 13th century, when it was conquered by England. The modern Gwynedd was one of eight Welsh counties created on 1 April 1974 under the Local Government Act 1972. It covered the entirety of the historic counties of Anglesey and Caernarfonshire, and all of Merionethshire apart from Edeirnion Rural District (which went to Clwyd); and also a few parishes of Denbighshire: Llanrwst, Llansanffraid Glan Conwy, Eglwysbach, Llanddoged, Llanrwst and Tir Ifan. The Local Government (Wales) Act 1994 abolished the 1974 county (and the five districts) on 1 April 1996, and its area was divided: the Isle of Anglesey became an independent unitary authority, and Aberconwy (which included the former Denbighshire parishes) passed to the new Conwy County Borough. The remainder of the county was constituted as a principal area, with the name Caernarfonshire and Merionethshire, as it covers most of the areas of those two historic counties. 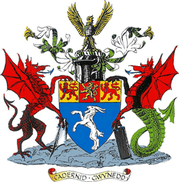 As one of its first actions, the Council renamed itself Gwynedd on 2 April 1996. The present Gwynedd local government area is governed by Gwynedd Council. As a unitary authority, the modern entity no longer has any districts, but Arfon, Dwyfor and Meirionnydd remain as area committees. The pre-1996 boundaries were retained as a preserved county for a few purposes such as the Lieutenancy. In 2003, the boundary with Clwyd was adjusted to match the modern local government boundary, so that the preserved county now covers the two local government areas of Gwynedd and Anglesey. Conwy county borough is now entirely within Clwyd. A Gwynedd Constabulary was formed in 1950 by the merger of the Anglesey, Caernarfonshire and Merionethshire forces. A further amalgamation took place in the 1960s when Gwynedd Constabulary was merged with the Flintshire and Denbighshire county forces, retaining the name Gwynedd. In one proposal for local government reform in Wales, Gwynedd had been proposed as a name for a local authority covering all of north Wales, but the scheme as enacted divided this area between Gwynedd and Clwyd. To prevent confusion, the Gwynedd Constabulary was therefore renamed the North Wales Police. The Snowdonia National Park was formed in 1951. After the 1974 local authority reorganisation, the park fell entirely within the boundaries of Gwynedd, and was run as a department of Gwynedd County Council. After the 1996 local government reorganisation, part of the park fell under Conwy County Borough, and the park's administration separated from the Gwynedd council. Gwynedd Council still appoints nine of the eighteen members of the Snowdonia National Park Authority; Conwy County Borough Council appoints three; and the National Assembly for Wales appoints the remaining six. The county has a mixed economy. An important part of the economy is based on tourism: many visitors are attracted by the many beaches and the mountains. A significant part of the county lies within the Snowdonia National Park, which extends from the north coast down to the district of Merioneth in the south; it is much larger than Snowdonia proper. But tourism provides seasonal employment and thus there is a shortage of jobs in the winter. Another problem with tourism is the demand that it creates for second homes. This pushes house prices out of reach of local people, to the detriment of the position of the Welsh language in rural areas. Agriculture is less important than in the past, especially in terms of the number of people who earn their living on the land, but it remains an important element of the economy. The most important of the traditional industries is the slate industry, but these days only a small percentage of workers earn their living in the slate quarries. The education sector is also very important for the local economy, including Bangor University and Menai College. Gwynedd has the highest proportion of people in Wales who can speak Welsh. According to the 2011 Census, 65.4% aged three and over stated that they could speak Welsh. It is estimated that 83% of the county's Welsh-speakers are fluent, the highest percentage of all counties in Wales. The highest percentages of Welsh speakers in Gwynedd are within the 5-15 age group, with 92.3% of those people stating that they could speak Welsh. The proportion of Welsh speakers in Gwynedd declined between 1991 and 2001, from 72.1% to 68.7%, even though the proportion of Welsh speakers in Wales as a whole increased during that decade to 20.5%. The Annual Population Survey conducted in 2018, estimates that 76.8% of those in Gwynedd who are three-years-old and above can speak Welsh. T. E. Lawrence, "Lawrence of Arabia"
^ "Authority population 2011". Retrieved 18 May 2015. ^ a b Bedwyr Lewis Jones. Enwau (Llyfrau Llafar Gwlad) (Llanrwst, Gwasg Carreg Gwalch, 1991), p. 5–6. ^ "Welsh speakers by local authority and broader age groups, 2001 and 2011 census". StatsWales. Welsh Government. Retrieved 31 October 2016. ^ a b "Anglesey & Gwynedd Joint Local Development Plan Topic Paper 10: Welsh Language & Culture" (PDF). Gwynedd County Council. Gwynedd County Council. February 2015. Retrieved 21 November 2011. ^ a b Census shows Welsh language rise. 14 February 2003. Retrieved 12 April 2007. Wikimedia Commons has media related to Gwynedd.